Ray Milland was an academy award winning actor. (He won an Oscar for his role as Don Birnam in The Lost Weekend.) It seems odd, therefore, that late in his career he was involved in several low-budget sci-fi and horror movies. 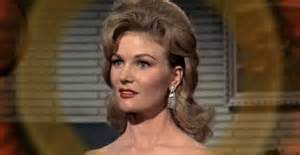 In the 60's, after having left Paramount, he worked in TV and with such entrepreneurs of cheapjack movies like Roger Corman. Sure, Milland did a few major studio roles during this time; he was Oliver Barrett IV's father in Love Story and the sequel Oliver's Story, he appeared in Elia Kazan's The Last Tycoon. 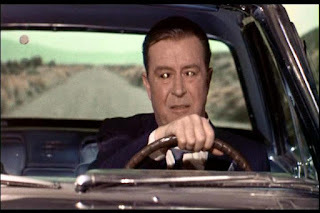 But also he was in such grade B drive-in flicks like Frogs, The Thing with Two Heads, another Roger Corman movie The Premature Burial, and Panic in the Year Zero!, which he also directed, all for American International Pictures which catered to the drive-in crowd. To be honest, X: The Man with X-Ray Eyes is a cut above the standard low-budget fare usually associated with AIP, and I think Milland is one of the reasons this picture is better. The problem with altruistic science is that sometimes it can go bad. (and with low-budget science fiction movies, that's a relatively frequent thing.) 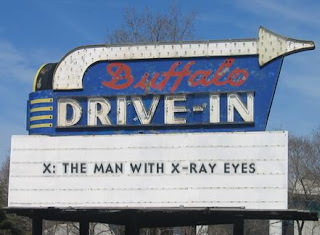 Dr. James Xavier (Ray Milland)is a doctor who is not satisfied with the normal range of vision that a human has. He wants to be better at his job, and as a result, has been experimenting with a drug that enhances the eyes. In a demonstration to an associate, Dr. Diane Fairfax (Diana Van der Vlis), he shows how a monkey with the drops in its eyes can see through several boards and see the colors of each board behind the first one. 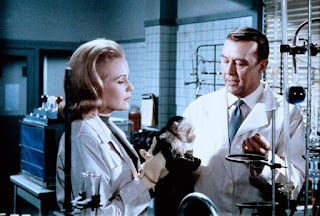 But the monkey dies in the experiment. Not from the drugs itself, it seems; it dies because it can't comprehend what it sees beyond the boards. 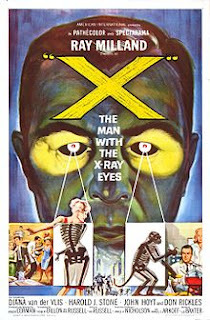 Despite this, Xavier experiments on his own eyes. And as a result, his first tests reveal he can diagnose a patient that his fellow doctor has misdiagnosed. But doctors in movies being ego-driven people, the fellow doctor refuses to accept Xavier's diagnosis and proceeds to operate on his own diagnosis. Xavier causes the fellow doctor to be unable to perform and proceeds with his own operation instead. Although successful, the fellow doctor tells Xavier he will see to it that Xavier is brought under malpractice charges. 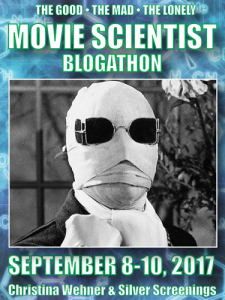 During a scuffle, Xavier accidentally knocks his adversarial doctor out the window, and the doctor plunges to his death. Realizing he will be accused of murder, even though it was an accident, Xavier goes on the run. He takes a job with a carnival, where he is billed as a psychic. His promoter is a real sleazeball played to perfection by Don Rickles. finds out the truth and induces Xavier to become a low-rent doctor who gives people advice on their medical condition. And through these people he is eventually found by Diane. When Xavier tries to dissolve the partnership with the promoter, the promoter tells him he knows his secret past and will reveal it to the police. Xavier leaves anyway, and the promoter shouts out the truth, which conveniently just happen to be heard by the entire state of police, apparently. Xavier steals a car and a long sequence of a chase occurs as he careens down highways trying to escape. I see by the clock on the wall that there's a spider behind, so I must leave. Drive safely, folks. This looks great! I'm serious! I love the premise, and I bet Ray Milland is fabulous in this role. 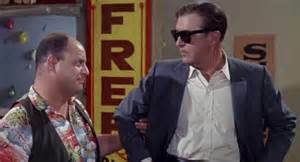 (I also like the idea of Don Rickles as a sleazy carnie.) Besides, if Ray Milland said he was proud of this film, then I know it's worth tracking down. Its not nearly as cheap as some of the Corman output I've seen. Well worth the time invested, I think. thanks for reading. 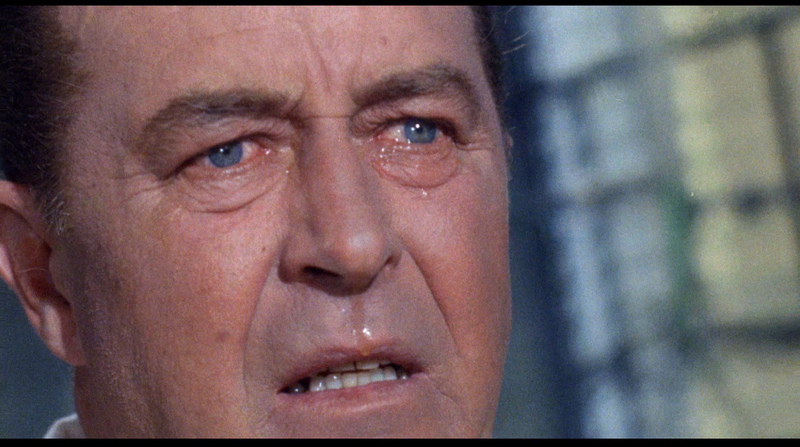 Wow, I never would have thought of Ray Milland in Roger Corman films. But I've always been a fan and especially like him when he's playing a bad or flawed character (his performance in Dial M For Murder is one of my favorites). How fascinating that he considered it one of the films he was most proud of! I am really curious to see it now. Hope you enjoy it. Of course, it's not Academy award material, but it is pretty interesting in its own right. Thanks for reading. Enjoyed this review. A good day's work is always something to be proud of, and if Ray did that then I may take a look. Glad you liked the review. Thanks for reading. Thanks for this great review of one of my favorite Roger Corman B films. I wrote about it on my own blog a while back. Panic in Year Zero! is also an interesting film, and is worth seeing. IMPLANNING' on a double feature with Panic in the Year Zero as one of the films in the near future. (Not right now... I'm exhausted from this weekend's burst of writing...) Thanks for reading. Reminds me of the adds they used to put in comic books for X-ray glasses. I always wanted a pair of those. I have a book somewhere that reveals those things were a crock...:-) Good thing you didn't waste your money. Thanks for reading. Gripping low budget Corman effort, genuinely scary in parts and thoughtful throughout. Essential viewing. The lighting gave me a headache... I have glaucoma damage in one eye. But it is entertaining. Thanks for reading. Heck of a lot better thanfrogs "". I wish I had that time back... Thanks for reading. Ray Milland is one of my favorite actors yet I've not seen this film,yet. Your review has made me want to see it before the year is gone. Hope you can find it. 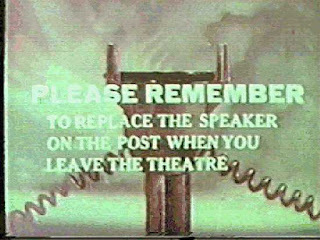 It was in a boxed set of Roger Corman movies. Thanks for reading.